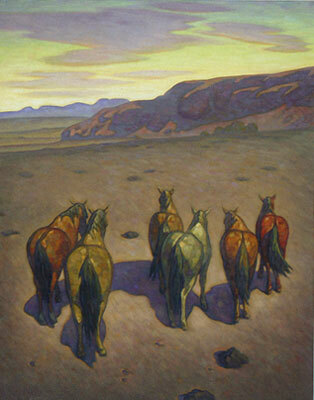 Howard Post, Six from the Remudas, Oil on Canvas, 60" x 48"
Howard Post’s view of Arizona is not seen through rose-tinted glasses. Post paints scenes that could be anywhere within the context of the rural West. Howard Post is an artistic product of his environment, he paints what he is familiar with. Post was born in 1948, and was raised on a ranch in southern Arizona. He embraced the cowboy way of life and became a successful rodeo participant, capturing the Arizona High School Championship and competing at the collegiate and professional levels. Art, however, was what really captured his interest and he pursued this interest beyond the degrees he earned at the University of Arizona (both a BFA and an MFA). After his formal education, Post became an illustrator for a time before going out on his own to pursue painting fulltime in 1980. 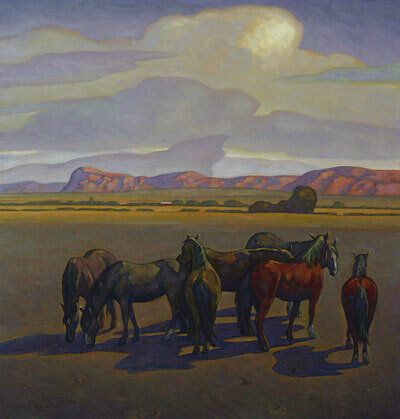 Howard Post, Seven Mares, Oil on Canvas, 36" x 36"
The impressionistic work of Howard Post places him in a small group of artists that could be described as Arizona regionalists. Post, along with landscape painters like Ed Mell, creates scenes that exist in the West. His paintings reflect the real life and land that Howard Post lives in and knows intimately. Howard Post’s acclaimed work has been featured in the Smithsonian, the Denver Art Museum, the Eiteljorg Museum of the West, the Buffalo Bill Historic Center, and his works reside in important corporate collections such as AT&T and United Airlines. Post has also illustrated books, including Magic Boots (1994), a western-themed story for children. 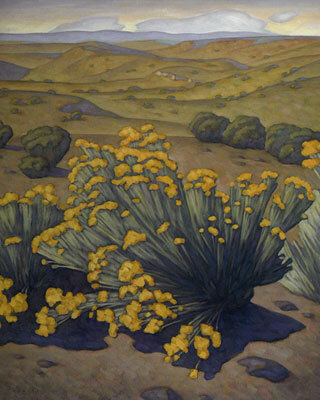 Howard Post, High Desert, Oil on Canvas, 36" x 44"